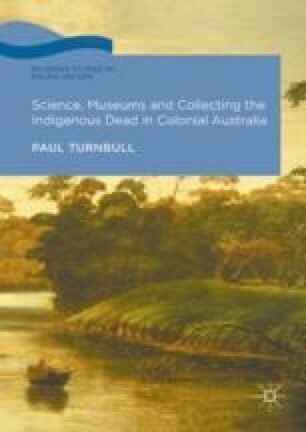 This chapter explores how Australian skulls and other skeletal specimens figured in the development of British thinking about the nature and causes of variation in humankind from the second decade of the nineteenth century until around the mid-1850s. Historians of racial science have generally assumed that by the mid-nineteenth century a shift away from environmentalist explanations of human variation occurred. Growing credence was given to the idea that dissimilarities in bodily form and psychology existed that were so deeply inscribed in our biology as to invite the conclusion that humanity comprised two or possibly more separately originating ancestral types. This polygenetic reinterpretation of human natural history has been said to owe much to scientists and intellectuals of the mid-decades of the nineteenth century correlating head shape with colonial reportage of the psychology, lifeways and culture of Australia’s first peoples. However, my concern in this chapter is to show that it is questionable whether studies of Indigenous Australian cranial morphology played any significant part in strengthening polygenetic accounts of human natural history. Rather, British anatomists and ethnographers of the mid-nineteenth century continued to favour explaining human variation, as Hunter and Blumenbach had done, as environmentally induced branching away from a single ancestral form. However, that said, attention is drawn in this chapter to the fact that British thinking about human variation became more biologically determinist, and there growing pessimism whether Australian and other indigenous peoples would ever be capable of integration within colonial society due to the bodily and psychological degeneration caused by living over many successive generations by hunting and gathering. As this chapter explains, the cause of this intellectual shift was the credence given to the arguments of Georges Cuvier (1769–1832), the great French comparative anatomist. Despite firmly believing in the unity of our species, and the susceptibility of the human body to environmentally induced modification, Cuvier held that a direct relationship existed between skull thickness, brain size and intelligence, and that Africans other darkly pigmented human populations were mentally inferior to Europeans by virtue of brain size. Hence there was no need for polygenetic theorising to explain why Indigenous Australians resisted integration within colonial society.